Judy Major-Girardin, associate professor of art and longtime colleague and friend of the late Graham Todd, accepted the Lifetime Achievement Award from President Patrick Deane on Todd's behalf. 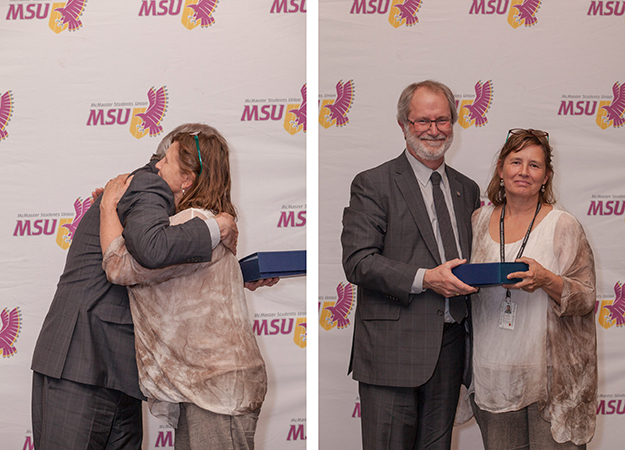 Some of the best and brightest instructors at the University were honoured at the annual MSU Teaching Awards ceremony last week. The awards were established in 1978 by the McMaster Students Union in order to recognize and encourage excellence in teaching. Recipients are presented with an award on behalf of all MSU members. This year’s Lifetime Achievement Award was posthumously presented to Graham Todd, an associate professor in the School of the Arts who lost his battle with cancer last spring. Associate professor Judy Major-Girardin accepted the award on his behalf. Admired by students and colleagues alike, Todd developed a reputation as a naturally gifted teacher and a keen observer with a desire to push his students to new heights. He was also a talented and prolific sculptor outside of the classroom, and his work was regularly exhibited across Canada and beyond. Todd’s remarkable career at McMaster spanned nearly three decades, and his legacy lives on in the form of a bust in Togo Salmon Hall. The Pedagogical Innovation Award was presented to associate professor Daniel Goldreich (Psychology, Neuroscience & Behaviour), while Kate Einarson (McMaster Institute for Music and the Mind) earned the Merit Award — recognizing a talented instructors in his or her first two years at the University. The Teaching Assistant Merit Award was presented to Yusuke Shimabukuro (Mathematics & Statistics).